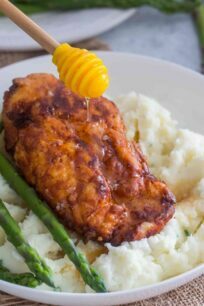 Instant Pot Brown Sugar Garlic Chicken is the perfect family dinner easily made in the pressure cooker. 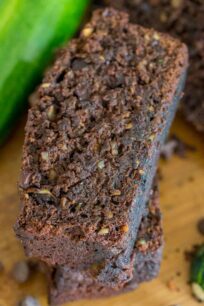 It is rich and flavorful ready in about 30 minutes. 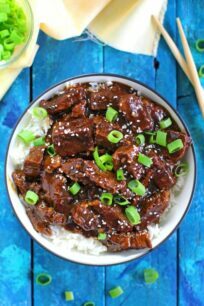 We love easy and delicious Instant Pot dishes. 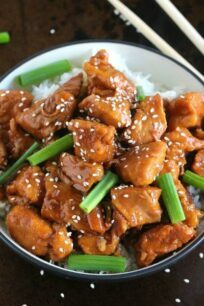 If you are a chicken fan, you might also like BBQ chicken, orange chicken, and Mongolian chicken. This recipe is one of our old time favorite comfort food. 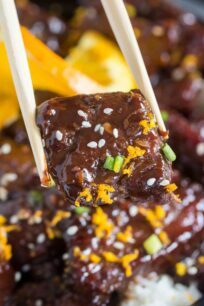 We are a big thighs lovers, and making them in the pressure cooker glazed with the most delicious sauce, is a win-win recipe! 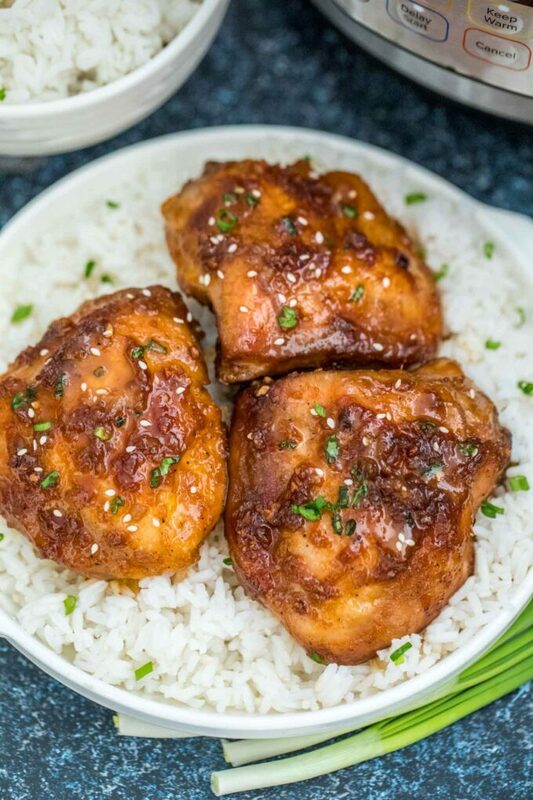 This Instant Pot Brown Sugar Garlic Chicken is the perfect recipe to make for dinner. The meat is super flavorful, juicy, moist and perfectly cooked at the fraction of the time. The sauce is to die for. The combination of garlic and brown sugar works amazingly well in this dish. It coats the thighs nicely with a rich and deep flavor. Also, this is such an easy and quick meal to make at home, that it will take you more time to drive to a restaurant to order takeout! We like serving it over some rice or veggies, and leftover are equally delicious! How long to Cook Chicken in the Instant Pot? The pressure cooker does a great job cooking meat quickly. For this recipe, we cook the thighs for 10 minutes. However, this might vary if you are using larger sized thighs. Please note the above guidelines are for fresh or thawed meat. If you want to use frozen meat, you can still cook it. However, the cooking time will increase. We have a good article and recipe on how to cook frozen poultry in the pressure cooker, you can access it here. How to cook Instant Pot Brown Sugar Garlic Chicken? In this recipe, we choose skin on thighs (because they taste amazing and extremely juicy). As with any meat cooked on the bone, this has tons of flavor. Also, you could use other cuts if desired, however for deeper flavor, we recommend sticking with thighs. You will need at least 1/2 cup of liquid to the pot to pressure cook chicken. Then, mix the sauce ingredients together, and pour the sauce over the thighs. Cover the lid, and cook for 10 minutes. 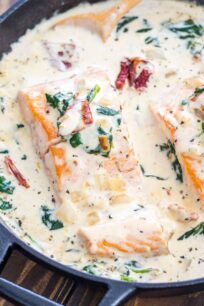 Can you make this dish in the Slow Cooker? Absolutely! 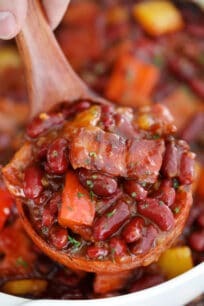 Cooking this dish for a longer period of time in the crockpot is the perfect alternative. The meat turns out flavorful, and extremely juicy. You can check the slow cook version of it in this link. Yes! The oven backed version with potatoes can be found here. 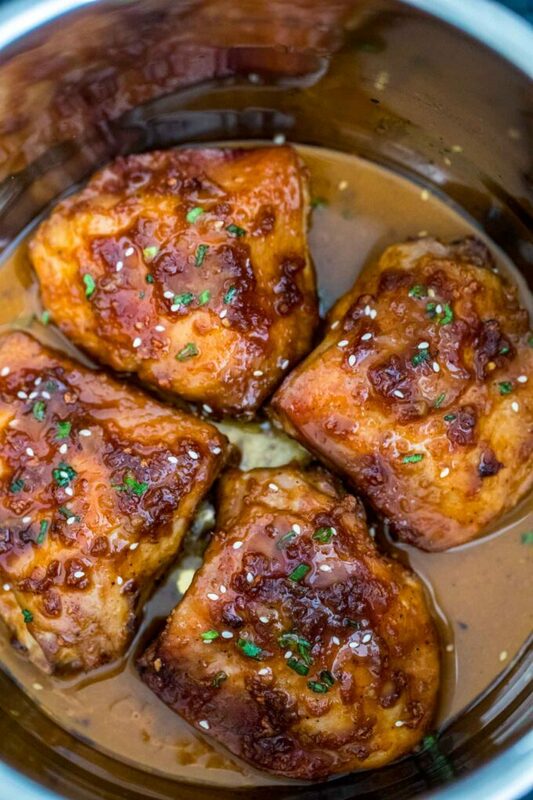 WHAT to serve with Instant Pot Brown Sugar Garlic Chicken? This recipe yields amazingly delicious and mouthwatering chicken which is great for dinner. We love serving it with either brown or white rice and some roasted vegetables, such as asparagus, brussels sprout. You can mix it up with roasted potatoes or mashed potatoes as well. 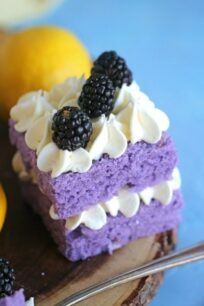 No matter how you serve it, it will be just delicious! 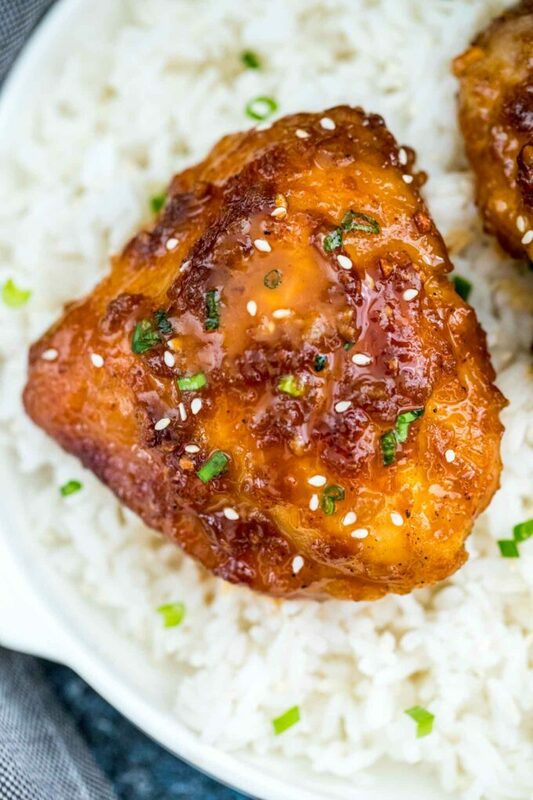 How to freeze Instant Pot Brown Sugar Garlic Chicken? Prior to freezing, ensure that the dish is completely cooled. Then, transfer it to an airtight container and freeze for up to 3 months. The night before serving, transfer it to the refrigerator to thaw. Also, you could warm it up in the microwave or oven for a few minutes and enjoy it with your favorite side dish. We use a 6-qt Instant Pot and we love it. However, if you plan on cooking a larger portion, go with the 7-qt size. If desired, you can use other meats, such as breasts or drumsticks. In addition, for a spicier kick, add some jalapeno or red pepper flakes to the dish. Always try using fresh minced garlic vs the canned version, as it gives a deeper and richer flavor. When the dish is ready, you can top it with some soy sauce if desired. The pressure cooker does a great job of producing juicy and tender meat. Also, if you want it extra crispy on the outside, we recommend to broil it for a few minutes once it’s done cooking under pressure. This is one easy step, but it is totally worth it. Select Saute on the Instant Pot, select temperature High and wait for the IP to read HOT. Once Hot, add canola oil, wait for it a bit to heat up and brown chicken thighs on both sides for about 3 minutes, until golden brown. Brown chicken in batches, set aside on a plate when done. Once done, add broth to the pot and using a wooden spoon, scrape the bottom of the pot. Add salt and pepper and place a trivet inside the pot. Arrange the chicken on the trivet, skin side up. Close the IP, lock it, point valve to sealed and select High Pressure. Input 10 minutes. It means that the chicken will cook on High Pressure for 10 minutes. Once done cooking, do a 5 minutes Natural Pressure Release, after which release manually any remaining pressure. Turn on oven broiler. Cover a baking sheet with foil and a little oil. Remove chicken from the IP and arrange onto the prepared baking sheet, again skin side up. In a small bowl mix all the Sauce ingredients, add 2 tablespoons of cooking liquid as well. Once combines, scoop the mixture over the chicken. Broil for 5 minutes, or until golden brown, careful to not burn the chicken. The sauce takes this over the top – SO TASTY! Thanks for sharing! 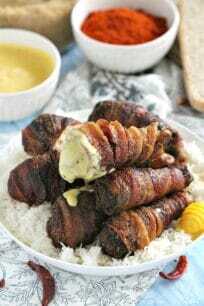 I love cooking with chicken thighs; I will have to make this for my family. Making my mouth water! I am in love with my instant pot! I cannot wait to try this one!